Interests:Computers,movies,read/write,talking about philosophy and religion. Cooperative Linux is the first working free and open source method for optimally running Linux on Microsoft Windows natively. More generally, Cooperative Linux (short-named coLinux) is a port of the Linux kernel that allows it to run cooperatively alongside another operating system on a single machine. For instance, it allows one to freely run Linux on Windows 2000/XP, without using a commercial PC virtualization software such as VMware, in a way which is much more optimal than using any general purpose PC virtualization software. it is a good idea,but I want to do something better. Why ? a) Linux has a better file system than Windows. c. Hmm, , but the whole point of WINE is to be able to run Windows apps WITHOUT needing a Windows OS License, I mean what do you want, blood? However 2 valid reasons (besides the 4 debatable ones) are more than enough. Cleared that there are good reasons for such a project, what do you have, besides a possible name for it? Don't want to put you down, mind you , but I suspect that this would be a very ambitious project, for which lots of knowledgeable resources would be needed, call me cinical, if you like, but I have seen so many projects on SourceForge abandoned in ""1 - Planning" or "2 - Pre Alpha" stage or that never released anything working, that I am a bit skeptical . Do you plan to run Windows on Linux filesystem ? You will need a filesystem driver for it. - Local fielsystem if Windows is in a separate partition or disk image. - Network filesystem if you want to share filesystem with host. Can Windows run from network filesystem ? I don't know. LinE may need much resource on the computer just like existing virtualization software. I think it is difficult or almost impossible to adjust amount of guest Windows RAM while guest is running. You have to pre-allocate guest RAM just like other virtualization software. Display adapter+keyboard+mouse is another major component. You need guest drivers for them. Or let Windows take control of the real display adapter+keyboard+mouse, user can still access Linux host by network. Another possibility is let Windows have its own display adapter separated from host's display but that is what I call "too much resource". CoLinE,where <Co = Co-operatively and LinE = LinE Is Not an Emulator> could be a method that allows <Windows> to run Co-operatively alongside <Linux> on a single machine. It should allow one to freely run <Windows> on <Linux>, without using DUAL BOOT and commercial PC virtualization software. LinE is a bad name, because it sounds more like running Linux on Windows like CoLinux. CoWine would be more correct in my opinion. Forget the name. 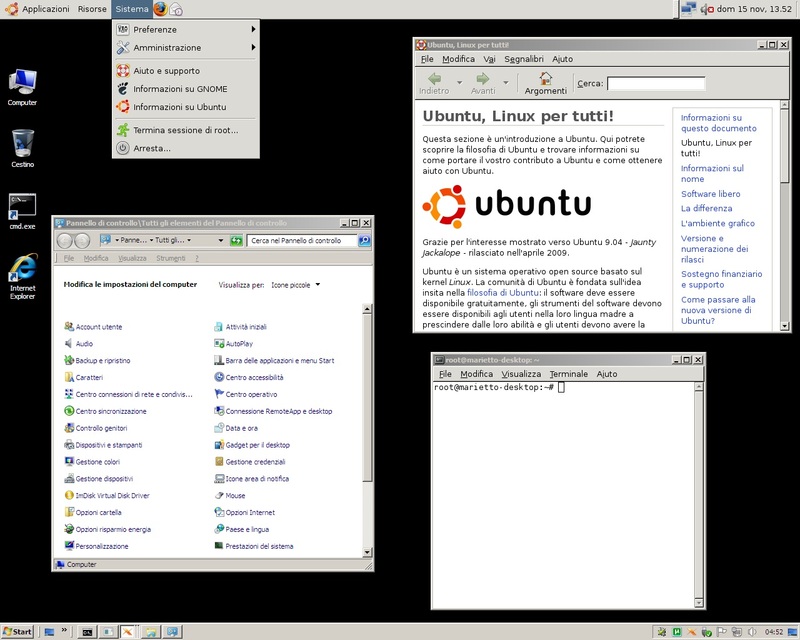 I'm studying a way to run Windows in a native way + Linux at the same time. I have almost everything in my mind. It is about mixing a lot of sophisticated techniques. I use virtualbox for this task. The seamless mode or fullscreen works good enough. Linux Unified Kernel is an open source project, we hope that through developing Linux OS to be compatible with Windows applications, more and more people could access to Linux, then use and like it. It's not easy to change one's habits, but the goal is worth our joint efforts. If you are interested in this project and eager to be one team member of us, please contact us by e-mail with your resume or phone call; if you participate in the part-time development, our open modules are available; if you just are a user of Linux Unified Kernel, your feedback or bug report is also a valuable contribution. No matter which form you choose, we all hope that there will be more open-source enthusiasts and Linux enthusiasts to participate in the development of Linux Unified Kernel project and do his bit to help the development of Linux. You can just run your Windows applications on the Linux Unified Kernel as an ordinary user. We are willing to receive your views and suggestions of Linux Unified Kernel. You can also use a variety of Windows applications to test Linux Unified Kernel. If you found any problem through testing, you can tell us in the forums, and we will fix it as soon as possible. 2) coLinux is good,but I don't want to run Linux on top of Windows. It makes no sense for me,because between them,the less secure is Windows. If your Windows installation is damaged,you can't run Linux (together with Windows) anymore. And again,I like the ext2/3 fs more than the ntfs fs. 3) I don't like so much the virtual machines,because they takes to much resources on your computer and you haven't the maximum compatibility. I'm talking about to play games,for example. 4) Linux Unified Kernel seems to be good,but it is in a early stage. I read all around that a lot of applications crash and I'm sure that you can't play games using it. I'm studying a project where I can use a native installation of Windows and Linux at the same time. I know,this is not so good,because you have to pay a license to use Windows,but I don't care. I want the maximum compatibility from the two o/s. When you have reached some conclusions, do share them with us. I'd really like to know more about this. Linux Unified Kernel seems to be good,but it is in a early stage. I read all around that a lot of applications crash and I'm sure that you can't play games using it. No,no,don't worry. I think that Windows is useful as Linux. There is nothing better than something else,in absolute terms. Only what meets perfectly your needs is perfect (for you). I tried win4lin some time ago,it's a crap ;)If there is no perfect solution for playing Windows games under Linux...then you can try to imagine to a good solution and maybe it will born. Imagination is more important than knowledge,said Albert Einstein. If there is no perfect solution for playing Windows games under Linux...then you can try to imagine to a good solution and maybe it will born. Imagination is more important than knowledge,said Albert Einstein. Until software companies start making all of their software standards compatible with Linux , the end-user (me & you ) doesn't stand a chance. Gaming is a lot of people's only reason to stay with Windows. what is this ? You can play Windows games on linux with it ? Anyway I don't think that gaming is the people's only reason to stay with Windows. At least here in Italy,where I live,there is a reason even more important,it is that many people do not know how to use Windows at all and they believe that Linux is too difficult to understand. Surely not, but it does has a number of zealots promoting it. One of the very few reasons why I never completely "switched" to Linux (and do not intend to do so in the next foreseeable feature) is because people like so much to hijack threads just for saying how good is Linux. This thread was already started in the Linux section, it already has the aim to hopefully integrate Linux with Windows, the OP obviously knew the adantages (or disadvantages) of Linux from the start, colinux, andlinux, virtualbox and Unified Linux Kernel were already mentioned, so what remains of your posts? Also, a Linux "zealots" would be horrified with militant Windows "advocates". Its a matter of opinion and intelligence. Double posts, who really cares its not like its a big deal. "The best software is the one that you know how to use"
I would like that everyone suggests NEW solutions for integrating Windows with Linux. Please provide practical ideas,not vague and useless topics. Please provide practical ideas,not vague and useless topics. that among these are Life, Liberty and the pursuit of Happiness. The source for this page has been copied from somewhere in the web, we apologize to the author for the inconveniences. I think that we could install Windows natively,but I dislike that the less secure operating system is the host of the most secure o/s,that's linux,so I've tought that the only thing I can do is to secure Windows,because Linux can be started from Windows only,viceversa it's not possible. I want to create a protected area with only the windows folder inside,because this is the most critical area. Viruses, trojans go there and they alter the correct working of Windows. The other folders, as users, programdata and program files could be kept outside. Programs can be installed / users can be added as usual,but they will be saved outside the virtual image. Using this way,we will not lose important informations when we reboot the computer and windows will be secured. There are many programs that work without having to write information inside the registry,so we don't have to worry that after having installed them and rebooted the computer,they will stop working. For all others programs,we can use portable applications. This is a way to use the same installation of windows for long,long time. I'm waiting for your suggestions. 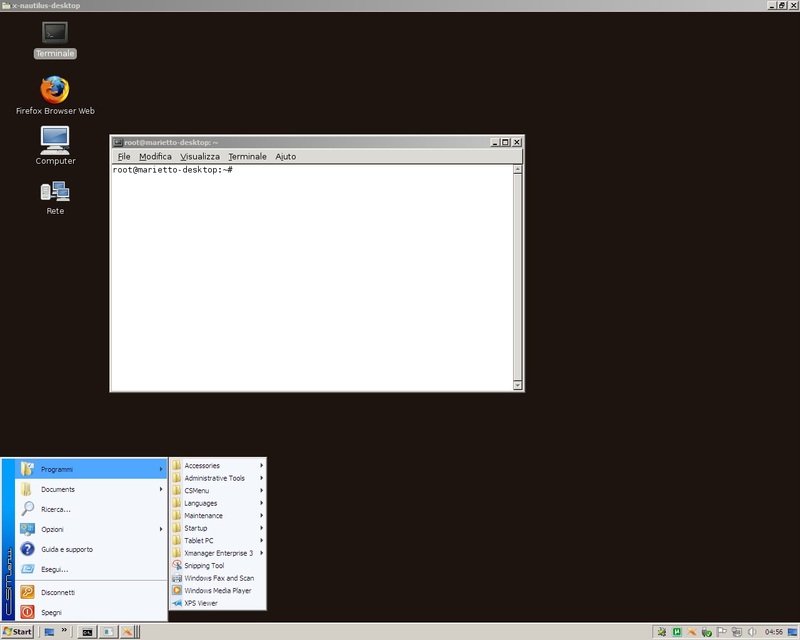 Windows 7 loaded into Ram + Ubuntu 9.04 native running together. Marietto, why not starting a new topic about windux on our project forge section? Today, I've also made available http://w07.net to be used a short URL for Windows 7 projects. Why not requesting one right now for your project?